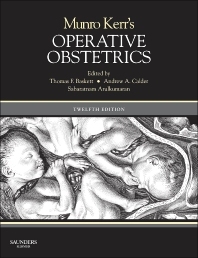 A highly illustrated, practical book covering the obstetric and surgical procedures used in intrapartum care, including commonly used procedures such as assisted vaginal delivery (forceps and vacuum delivery) and more rare techniques such as major vessel ligation and embolization and internal podalic version. The authors take a step-by-step approach to each technique and includes 'tips' and 'pointers' that only an experienced obstetrician would be able to describe. The book is enlivened by the inclusion of short, relevant 'historical highlights'- readers should find these enlightening and entertaining, providing a link with the original Munro Kerr text.